Federal safety investigators announced recalls for the 2013 Buick LaCrosse and the 2013 Cadillac SRX because of a computer software glitch that controlls the transmission. About 27,000 vehicles are involved in the recall. Reports from NHTSA say that the transmission can accidetnally be shifted into "sport mode" and that can affect the engine, which can lead to the risk of a crash. Got a lemon Buick LaCrosse or a lemon Cadillac SRX? 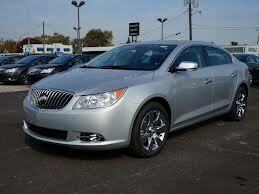 Want a new Buick LaCrosse or a new Cadillac SRX or your money back?